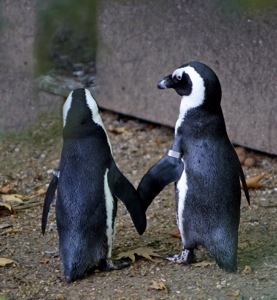 Penguins are fascinating birds; their habits and actions seem so human-like at times. This picture particularly struck me. we have shared and seen. Written in the spirit of Robert Frost and Dante, I have adapted the terza rima. Thank you. And I thank you for adding to my vocabulary–onyons. I love it and the fact you chose to compliment my poem with it. Thank you. I think many couples who have been together a long time feel this. Like the picture. Love the poem.